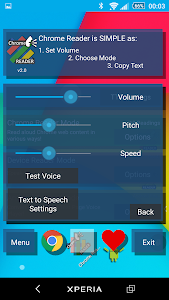 "Browser" Reader for Chrome lets your eyes rest and have your ears do the Reading for you; by speaking the text you want aloud from the Chrome Browser using Voice. 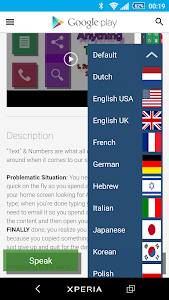 This FRIENDLY app is aimed both at basic users who are not familiar with technology, as well as advanced users who just want to perform this task in a very simple manner. 2. Copy any text from the webpage. 3. Put your device down and listen. 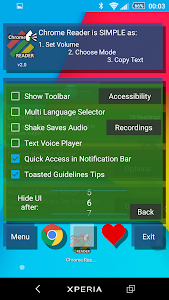 TIP: Shake device to stop the voice reading and save it as audio content. Once you highlight the text you can also press the 'select all' button which is left to the 'cut', 'copy' & 'paste' buttons and then copy the text to read the whole webpage! It works great for saving pages for offline voice reading. 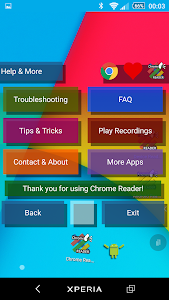 Browser Reader for Chrome was built on an actual android device AND have been tested on many android devices in order to reach maximum compatibility all over the world for people in need for this productive & Educational app! 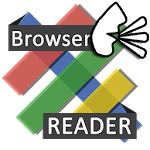 No android emulators were used in the making of Browser Reader for Chrome. 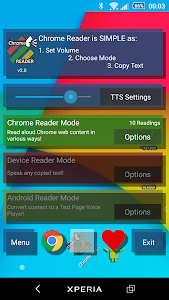 According to many reports by users, Browser Reader for Chrome actually helped them with Pronunciation, Reading and even Focusing on Listening as you can have the voice reading along with you just like in class with a teacher. 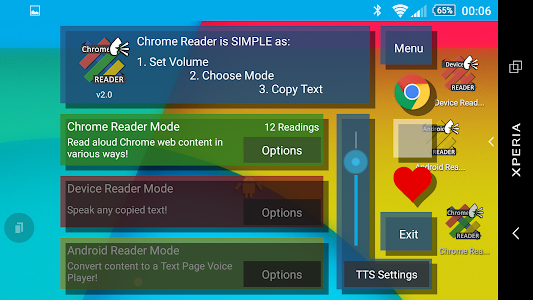 Relaunch of the Chrome Reader app as a free app! Similar to "Browser Reader for Chrome"
You write , I read !